The design is fairly simple. The rig is just a rectangular panel with 4 pockets. 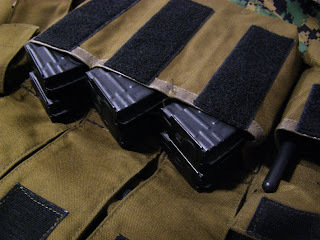 Starting from the right side (wearing it) there is a relatively big pocket designed for the field trauma kit. Actually I intend having my PMR radio in there. Next to it and to the center there is a big pocket divided in 3 double cells for the magazines. Each of the double cells is covered by a flap that closes with a Velcro strip. To the left hand side there are 2 smaller pockets. 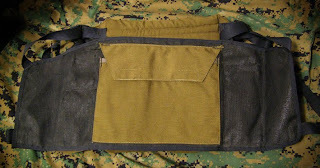 One is the original radio pouch and a grenade pocket. 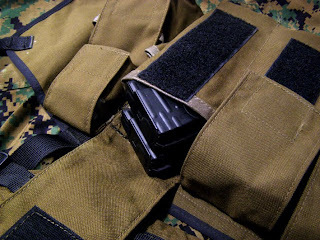 The grenade pocket is way too small, so most probably I will rest spare batteries in it. The other one will be used as a general purpose pocket filled with speed loaders, extra flash light and a multi tool or so. The whole panel is backed with heavy duty mesh. 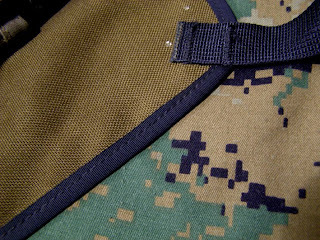 To the rear of the panel there is a flat pocket for maps, intel, etc covered with a flap secured with Velcro. Αναρτήθηκε από Vaszi bacsi στις 1:24 π.μ.